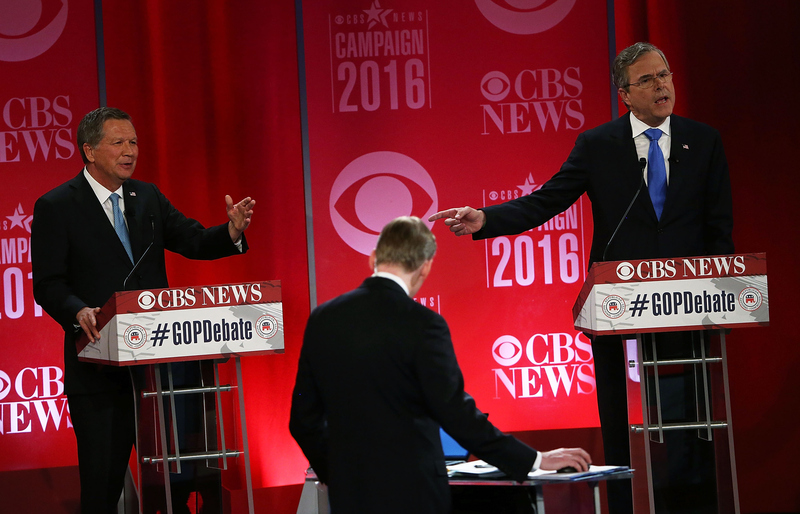 Jeb Bush v. John Kasich: Who's the better governor? During Saturday's GOP debate, Ohio Gov. John Kasich and Florida Gov. Jeb Bush argued over the growth of Medicaid in their respective states. It began when Kasich was asked about how enrollment and costs in the program grew after he pushed through an expansion of the Medicaid program. He did so over the objections of many Republicans in his state. "Our Medicaid programs are coming in below cost estimates, and our Medicaid program in the second year grew at 2.5 percent, "he said. "When we expand Medicaid and we treat the mentally ill, and they don't live under a bridge or live in a prison, where they cost $22,500 a year. When we take the drug-addicted and we treat them in the prisons we stop the revolving door of people in and out of prisons and we save $22,000-- $22,500 a year. Guess what else? They get their lives back." Bush chimed in to say he admires all Kasich was "supporting spending more money on drug treatment and mental health," but said it only happened because he expanded Obamacare. "Obamacare's expansion, even though the federal government is paying for the great majority of it, is creating further debt on the backs of our children and grandchildren," he said. "We should be fighting Obamacare. Repealing Obamacare." He noted that he also opposed it as a private citizen when Florida Gov. Rick Scott was considering a Medicaid expansion in Bush's home state. Kasich was prepared with some numbers when he swiped back at Bush. "His first four years as governor, his Medicaid program grew twice as fast as mine. Okay? It's just a fact," he said. "Now, with Obamacare, I've not only sued the administration, I did not set up an exchange. And he knows that I'm not pro-Obamacare. Never have been," he added. Kasich also noted that President Ronald Reagan expanded Medicaid five times "to try to help the folks and give them opportunity so that they could rise and get a job." In a parting jab, Bush said that he wanted South Carolinians to know that Kasich had expanded Medicaid but South Carolina Gov. Nikki Haley had not. He said the Cato Institute, which ranks governors based on spending, "rank [Kasich] right at the bottom. And Governor Haley is ranked at the top." "South Carolinians want to make sure they elect the most conservative governor or candidate that can win," he added. The 2014 report card from Cato had Haley tied for eighth place and a "B" score. Kasich was tied for 13th from last and had a "D" score.